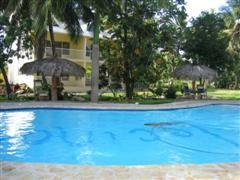 Our pool and bar have proved to be the best ever! staying cool tools. 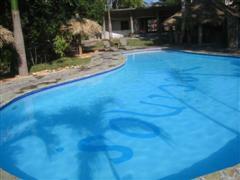 What a great spot for favorite friends + drinks to meet and chill. 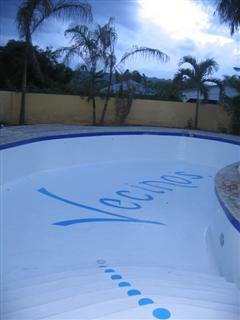 Painting the name "Vecinos" on the bottom of the pool took some ingenuity. The masking tape I'd planned to lay out the letters with, didn't stick. I ended up using a rope, extension cord, a broom and dustpan, plastic pipe and some towels. 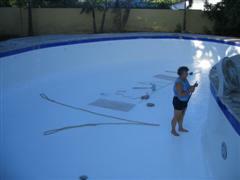 We could hardly wait for the paint to dry, so we could fill the pool and jump in for a swim. Pure JOY! We practically lived in the water at first, and spent "many a moonlit night", floating around, sipping our drinks and dreaming up possibilities. 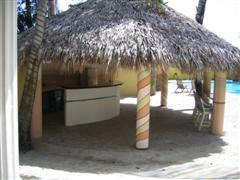 Adding 4 palapas around the pool for shaded seating, seemed like the logical next step after putting a thatched roof over the bar. 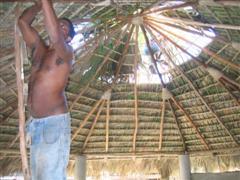 We chose the traditional method of building thatched roofs, where each cana leaf is tied to the pole frame by hand. 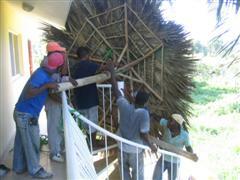 It's more work, and the craftsmen who still know that old skill, charge accordingly. 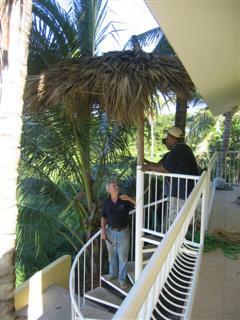 In a flash of brilliance, Les decided to get another thatched roof put over the spiral staircase behind the condos. Great idea! keeps the stairs dry when it's raining. The cana leaves that make up the thatched roofs of the palapas by the pool and bar , help them blend into their natural surroundings while providing welcome shade. The right "staying-cool-tools" to deal with the tropical climate.